Google Analytics 'Real Time': Monitor Your Blog Visitors Live! Google Analytics has always been the top website/blog statistics solution all around the internet. With all other Google's product being renovated lately, including Gmail, YouTube, Blogger etc, Google Analytics has also attained significant developers attention. We see new features being added to an amazing blog metric program, but few of them are effective to every body out there. Not all the features of the comprehensive tool are used by the webmasters, but there is one new addition that speaks for its self. Google Analytics 'Read Time' preview. Yes! Every webmaster would be amazed to get their hands on this mouth watering feature that has been pumped into Analytics, lately. 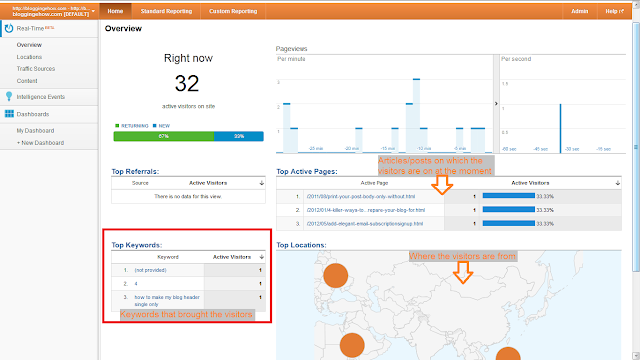 3-Google Analytics 'Real Time': Monitor Your Blog Visitors Live! 4-How To Setup Google Analytics Goals? 5-Google Analytics: How To Track Your Audience Comprehensively! :: Series end by 26th August 2012. How To Use Google Analytics Real-Time? In order to use Google Analytics 'Real-Time', you simply have to login to your usual Anyaltics account and navigate to 'Real-Time' option on the navigation buttons on the left side bar. With 'Real-Time' feature built in Google Analytics, we can monitor the online visitors (number of online readers), the articles/posts that they are reading, the real-time they are spending on the article, their traffic source (returning visitor, referral or organic i.e via search engines). There is a map built in the Real-time view that shows up the location of the visitor on the world map in real time. The moment the visitor lands on the blog, a green circle indicates that new landing, that gradually fades in to an orange circle that represents the readers presence on the blog. Keywords are also listed along the visitors that brought them to a particular blog. So you can get to know the top performing articles (in real time) and the keywords related to them. Can Analytics 'Real-Time' Be a Part Of Our Daily Routine? Not at all. To me, this amazing feature is more of a fancy tool. A blog's growth cant really be judge with the help of real-time metrics (though helpful) as we often need data that is spread over a decent amount of time. At least 1 month. How Often Do You Use 'Real-Time' Feature? Lets us know how often do you use Analytics Real-Time in your average blogging routine. How useful is it for you to monitor your blog's growth and then take appropriate steps. 15 Highest Paid Hollywood Actors Of All Time! Titanic Star Leads! BloggingeHow | Making Blogging Simpler: Google Analytics 'Real Time': Monitor Your Blog Visitors Live!